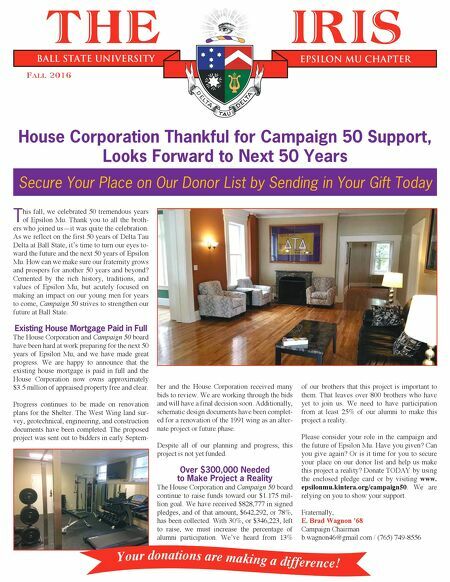 Ball State University Epsilon Mu Chapter Fall 2016 THE IRIS House Corporation Thankful for Campaign 50 Support, Looks Forward to Next 50 Years T his fall, we celebrated 50 tremendous years of Epsilon Mu. Thank you to all the broth- ers who joined us—it was quite the celebration. As we reflect on the first 50 years of Delta Tau Delta at Ball State, it's time to turn our eyes to- ward the future and the next 50 years of Epsilon Mu. How can we make sure our fraternity grows and prospers for another 50 years and beyond? Cemented by the rich history, traditions, and values of Epsilon Mu, but acutely focused on making an impact on our young men for years to come, Campaign 50 strives to strengthen our future at Ball State. Existing House Mortgage Paid in Full The House Corporation and Campaign 50 board have been hard at work preparing for the next 50 years of Epsilon Mu, and we have made great progress. We are happy to announce that the existing house mortgage is paid in full and the House Corporation now owns approximately $3.5 million of appraised property free and clear. Progress continues to be made on renovation plans for the Shelter. The West Wing land sur- vey, geotechnical, engineering, and construction documents have been completed. The proposed project was sent out to bidders in early Septem- Secure Your Place on Our Donor List by Sending in Your Gift Today ber and the House Corporation received many bids to review. We are working through the bids and will have a final decision soon. Additionally, schematic design documents have been complet- ed for a renovation of the 1991 wing as an alter- nate project or future phase. Despite all of our planning and progress, this project is not yet funded. Over $300,000 Needed to Make Project a Reality The House Corporation and Campaign 50 board continue to raise funds toward our $1.175 mil- lion goal. We have received $828,777 in signed pledges, and of that amount, $642,292, or 78%, has been collected. With 30%, or $346,223, left to raise, we must increase the percentage of alumni participation. We've heard from 13% of our brothers that this project is important to them. That leaves over 800 brothers who have yet to join us. We need to have participation from at least 25% of our alumni to make this project a reality. Please consider your role in the campaign and the future of Epsilon Mu. Have you given? Can you give again? Or is it time for you to secure your place on our donor list and help us make this project a reality? Donate TODAY by using the enclosed pledge card or by visiting www. epsilonmu.kintera.org/campaign50. We are relying on you to show your support. Fraternally, E. Brad Wagnon '68 Campaign Chairman b.wagnon46@gmail.com / (765) 749-8556 You r donations ar e m aking a d ifference!